The play's title is a misnomer. This is no who-done-it. Perhaps the real mysteries are, how did the each of the actors keep up the fast pace and a straight face. 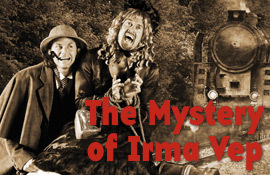 Without hesitation, "Irma" is simply one of the funniest comedies ever written. Yet, "simply" is the wrong word, as "Irma's" plot is quite detailed, but at the same time it's not important to understand what is going on. Hmmm? The characters, set, sound effects, lighting, costumes, and most importantly the dialog are spoofs of movie classics. "Rebecca," "Wuthering Heights" and "Gaslight" meet "Psycho," "Deliverance," and "Twilight" (okay, so the latter isn't a classic, yet). Toss in speeches from Shakespeare's "Richard III" and "Hamlet" and the hodgepodge is hilarious. The plot: the husband of the deceased lady of the manor (located on the foggy moors of England) remarries. Life on the estate is not very pleasant for new bride Enid. The maid hates her, hubby hunts a lot, and werewolves deliver the eggs and milk. However, Enid does enjoy a pithy ukulele duet with housekeeper Jane, as well as reading the one and only book in the library. This all sounds rather weird and stupid. It is. Take all of the above and cast only two actors, each playing multiple roles, sexes, and species, and this explains why "Irma" is unbelievable and unbelievably funny. Josh Aaron McCabe (Lady Enid, et al) and Ryan Winkles (Lord Edgar, etc.) are the acting duo who carry it all off while changing costumes in seconds. Fine actors in solo roles, put the two together on stage, and their quickly timed banter, movement, and expressions are priceless. McCabe's wide-eyed Enid balanced with Winkle's sly tilt of the head say a thousand words - all laughable. Pregnant pauses, sexual innuendo, and double entendres are aplenty. In recent years, Kevin Coleman has directed some of the most successful comedies at Shakespeare & Company. "Irma" is his best effort yet. It is safe to say that audience members will leave the theatre having missed some of the lines, because they were too busy laughing at others. BTW: Kudos to the three costumers, who deservedly took closing curtain bows.